Beth Ellis is Eagle Rock’s Associate Director of Students. Beth began her Eagle Rock career in 2004 with a Public Allies fellowship in the Learning Resource Center. 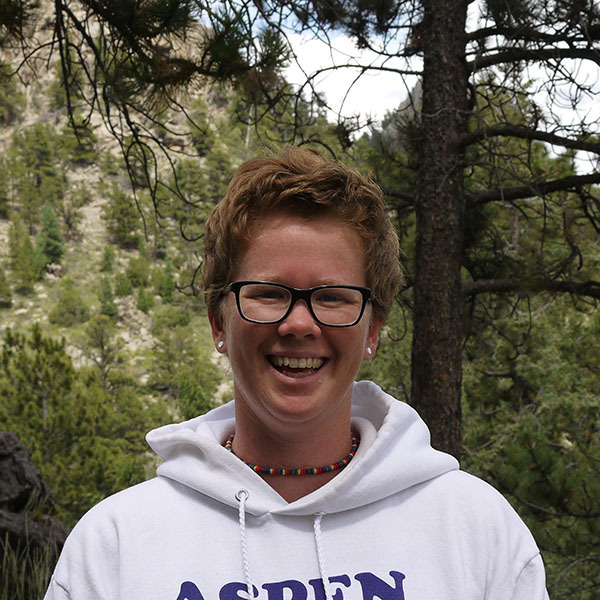 After her fellowship year, Beth became the LRC Instructional Specialist, as well as an Aspen Houseparent. Beth moved to the student services team two years ago, where she now serves as the Associate Director of Students. In this role, Beth and her team support the visioning, development, and delivery of the residential life curriculum, which includes advisory, KP, evening activities, house life, and everything in between. Before ERS, Beth was a successful graphic designer at Catt Lyon Design in Cincinnati, Ohio. She also served a term at Public Allies Cincinnati as a community organizer at ECO: Environmental Community Organization. Beth earned her undergraduate degree at the University of Cincinnati College of Design, Art, Architecture, and Planning. She lives on campus and with her partner, Janet, and her right hand dog, Lucy. The thing I love most about Eagle Rock is the opportunity and responsibility to grown and learn every day.